RadarCube is a fast and powerful ASP.NET OLAP control providing you with a unique chance of supplying the web site with the MS Analysis 2000 or 2005 client abilities. It is entirely authored in C# 2.0 and can be an excellent substitute for the OWC PivotTable control. - Two working modes: cube browsing and displaying the results of any MDX-queries. - Ability to create additional calculated measures on the client or server side. - Supports additional calculated members of hierarchies on the client/server side. 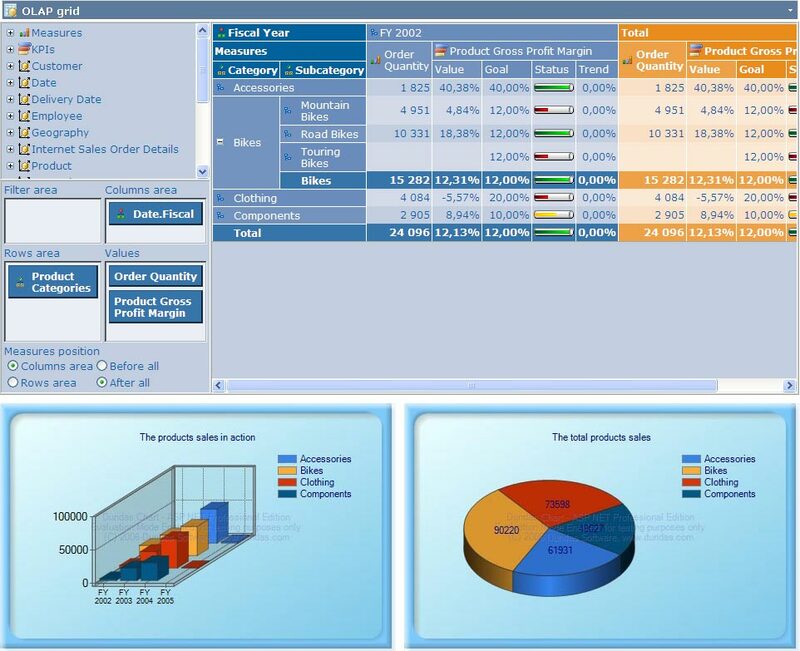 - Ability to simultaneously display a set of measures, named sets and KPIs in the Grid. - Interactive drill-down support of all types of hierarchies separately for every grid cell. - Saving and restoring the current OLAP slice. - Member grouping on any hierarchy level without changing the hierarchy levels structure. - Separate hierarchy or dimension sorting on any level. Ability of any sorting method overriding. - Ascending or descending sorting based on any column value in the OLAP grid. - Supports filtering of any set of hierarchy members with or without applying these filters in the OLAP calculations. - Auto filtering of the hierarchy members depending on their values in the grid. An ability to select some major/minor members, either according to their rank or on the Pareto principle. - Custom rendering in any grid cell. - Custom popup menus in the grid (all browsers). - Handy integration with charting and other third-party components. - Flexible export to: BMP, CSV, GIF, HTML, JPEG, PDF, PNG, TIFF, TXT, XLS, XML.